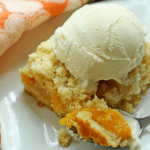 These homemade peach crumb bars are always a hit. Wait until summer for fresh peaches or use frozen to get that wonderful peach flavor anytime of year. Preheat the oven to 375 degrees F. Prepare a 8×8-inch baking pan with the non-stick coating of your choice. For the crumb and crust, whisk together flour, sugar, baking powder and salt. Next, cut in the cold butter using two forks or a pastry cutter then slowly mix in the egg yolk and cold water. Don't worry if the dough seems really crumbly. It should be! Next take half of the crumble mixture and press into the prepared pan. The rest should be saved for the top of the bars. Stir together peach slices, lemon juice, flour, sugar, cinnamon, nutmeg and vanilla until combined. To assemble, evenly add peach filling to top of crust. Next sprinkle the remaining crumble over the top of the peach filling. Bake for 30-38 minutes or until golden brown and set. Cool bars to room temperature then cut and serve.